I learn all kinds of handy things from my friends. Just the other day, they introduced me to a new (to me) kind of brunch beverage (one that may also cure you from a night of overindulgence with a little hair-of-the-dog), the Beer-Mosa. Now it isn't news that beer-based cocktails have been all the rage for awhile, but I for one had yet to sample the Classic Mimosa's less snooty cousin, an OJ spiked Beer concoction that was surprisingly refreshing. 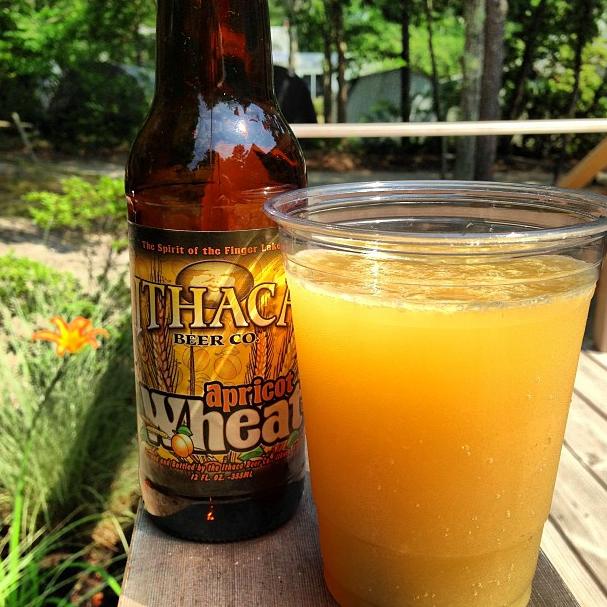 Simply fill a tall glass 2/3 of the way with Apricot Wheat Ale check out Ithaca Beer Co.
And add a large splash of Orange Juice on top. Give a stir and enjoy. Amante Picante Margaritas, Photo by Eric S.
This past weekend we hosted a little dinner party at my family's bungalow for my best friend and her husband. We always have a great time together, so much so that I hate the thought of being stuck in the kitchen while all the usual hilarity ensues. Initially, I was toying with the idea of grilling, but I ditched that plan in favor of a multi-course seafood meal. 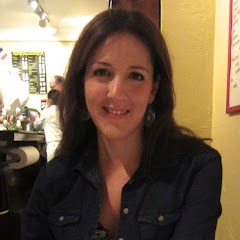 Plus, it was a brutal 90 degrees out so standing over a hot grill (who am I kidding? making my husband stand over a hot grill) didn't seem all that appealing. You may think that serving a meal with this many courses could never be easy, but I am here to tell you it can - the key is making good choices by serving simple, mostly make-ahead, no-cook dishes, while tackling some of the prep and chopping in advance. In today's post, we'll share four dishes and a smashingly good Margarita, all of which require minimal effort. This is because 3 of 4 courses are served chilled or at room temperature and call for "assembly" rather than cooking. As such, all three beginning courses can be made/prepped ahead. The entree course (my favorite, Linguine with Clam Sauce) comes together in under a half hour and is incredibly easy to throw together. I like to take a long pause before serving it as a final plate. This way, I have plenty of time to join in the merriment before taking a little break in the kitchen to finish everything off. It's also nice to be able to give your guests time to again rev up their appetites, so start early, eat slowly, and enjoy. Cocktail Hour with Oysters? Yes, Please! Check out this slightly spicy,refreshing and not-too-sweet cocktail that my Sister-in-Law recently introduced me to - the Amante Picante Margarita. My best friend, who is always full of surprises, brought along little cocktail umbrellas that worked perfectly in our drinks. How cute is she? 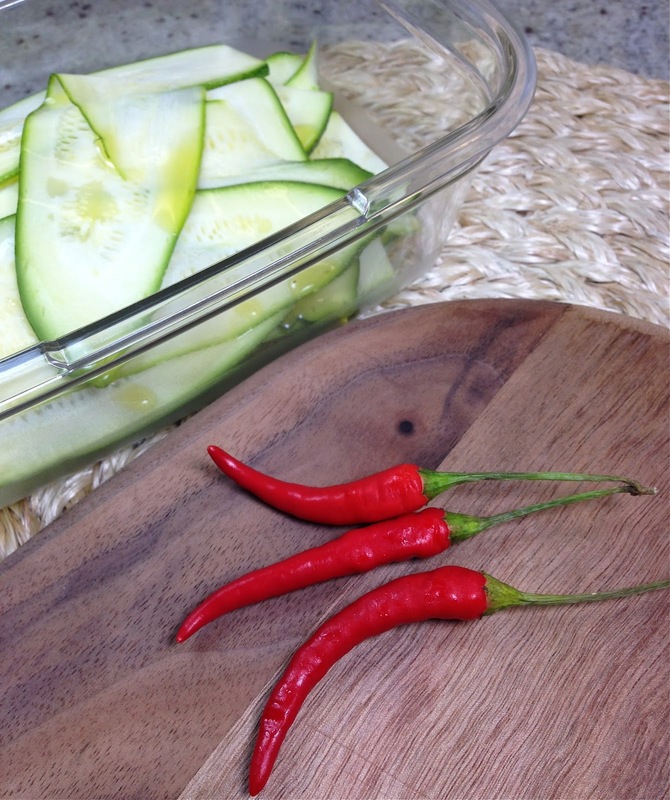 The Amante Picante Can be Made an hour in advance. 1/4 Cup Cilantro, plus additional for garnish. In a pitcher, muddle up the cucumber (all but the 8 slices for garnish), Jalapeno, and a 1/4 Cup of Cilantro. Add the Tequila, Lime Juice, Agave Nectar and optional Bitters. Allow to refrigerate about an hour. 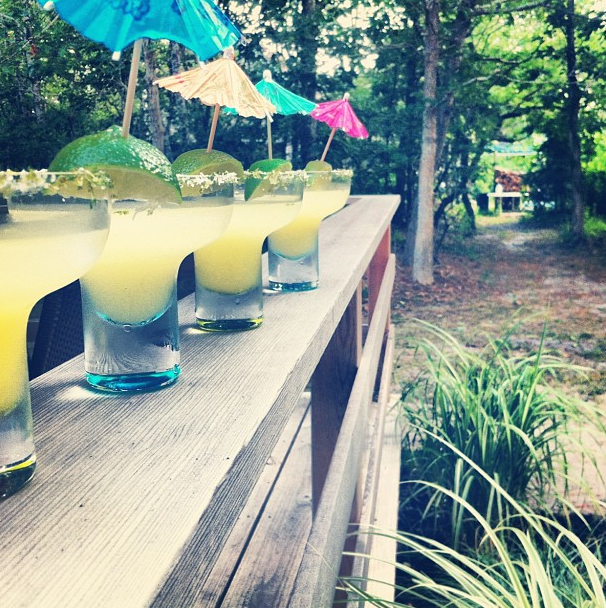 When ready to serve, wet the rims of 8 rocks or margarita glasses with a Lime wedge and coat with Lime Salt. Fill the cocktail shaker with ice and working in batches and adding fresh ice, shake the cocktail and strain into glasses (removing all solids). 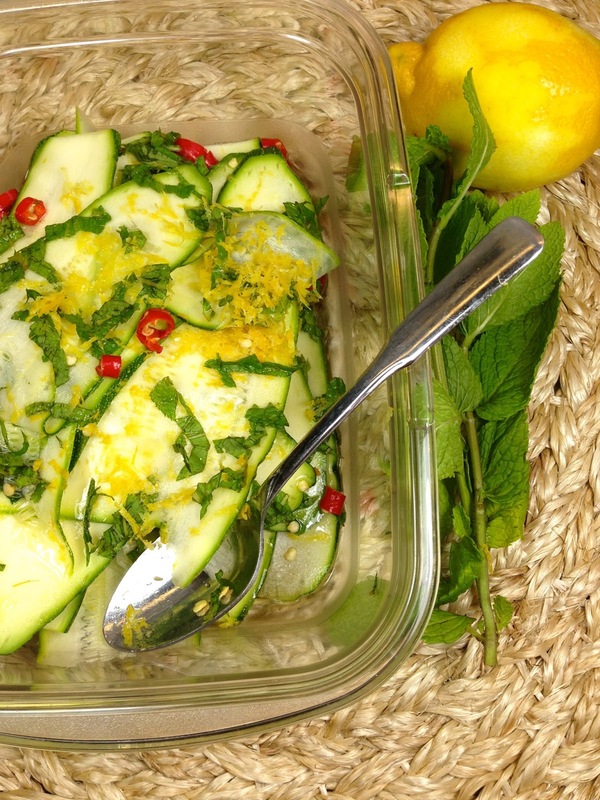 Garnish with Cucumber, Cilantro and Lime. Enjoy! You know what pairs well with the spicy brightness of the Amante Picante Margarita? 1 Container Spicy Salsa Verde (with tomatillos, lime, jalapeño) Freshdirect's is our fave. Plate oysters on a bed of Ice and squeeze one Lime over all of them. Drop about a quarter teaspoon Tequila over each Oyster. Drop about a half teaspoon Salsa Verde on each Oyster as well. Garnish plate with Lime Wedges and Cilantro Sprigs. What's easier than our next dish? Probably nothing. Individual Lump Crab Cocktails are a favorite go-to appetizer of mine (for the full recipe, click HERE). I buy Pasteurized Lump Crab in the can and toss it with Salt, Pepper, and Lemon Juice. Then I pop it in a Ziploc bag in the fridge until ready to serve. I have my plates ready to go in advance with some fancy lettuce lining the bottoms. Sometimes, I even make this portable by serving it in a Martini Glass. When I'm ready to bring the Crab Cocktails out, I simply portion out the Crab, squeeze some more Lemon Juice over it and garnish with lots of chopped Chives alongside a dollop Cocktail Sauce. Can't miss! Like Classic Caprese Salad? Then you'll love this version that gets extra twist with the addition of Peaches and Burrata instead of the usual Mozzarella. This is best made fairly close to serving time because Peaches can turn brown in the air. Arrange the Tomato, Peaches in whatever formation you prefer. Sprinkle Peaches and Tomatoes with a bit of Salt and Pepper. Add the Burrata, again, in whatever configuration you prefer. Finally, drizzle everything lightly with Balsamic Cream if you have it, and drizzle again with a little bit of Balsamic Vinegar and Extra Virgin Olive Oil. Top with the Basil Leaves and sprinkle all over with the Basil ribbons. Enjoy! After several courses, everyone was understandably getting full. I always enjoy taking a nice long break before popping back into the kitchen to throw the final dish together. Should take you about 20-25 minutes. Clean the fresh Clams in advance and pre-chop the Garlic and Parsley to make this dish super fast to prepare. It gets raves! 3 1/2 Dozen Littleneck Clams, scrubbed thoroughly. Ask the fishmonger to pick out the smallest ones possible. Set a pot of salted Pasta Water to Boil. Cook as directed on package. Next, add both cans of Chopped Clams with their juice to the pot. Turn up the flame to medium. Add 1 cup of the Dry White Wine. Add the Black Pepper and Crushed Red Pepper to taste. I like to use at least 1/2 a teaspoon. Bring liquid to a light boil and add all the fresh Clams to the pot. Add the remaining 1 Cup of Wine. Re-cover pot and cook another 3-4 minutes. It should come to a gentle boil. Pull clams out immediately with tongs one by one the moment they open and set aside in an extra bowl. Give the pot a stir and continue to cook, continuing to remove Clams out one by one as they pop open. You may have to shuffle them around to make space for them to open one by one. Discard any that do not after a reasonable period of time. To assemble: Plate Pasta into bowls, and top with even amounts of fresh Clams. Pour a generous amount of Broth from the pot over each portion. Garnish with Parsley and enjoy!! That does it! I hope you'll try our easy Seafood feast for your next dinner party. Happy cooking! Sure, it happens to be Meatless Monday, but today's post is just an everyday celebration of vegetables and all the wonders they possess. "Vegetarian" the cuisine, not just the lifestyle, has really caught on, and that, as they say, is a good thing. From enterprising chefs to the everyday cook, so many are on board with the idea that vegetables, when treated right, can hold all the delicious appeal and decadence of an omnivore plate. Summer's an ideal time to incorporate more vegetables into your diet. 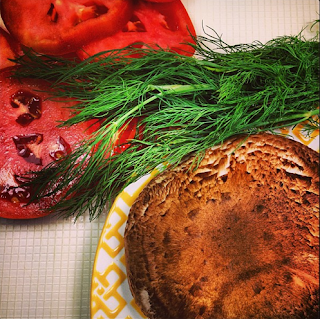 Portobello Mushroom "BLT" with Dill Mayonnaise. Looking for an elegant veg side dish? Zucchini Crudo with Chili, Lemon, Mint and French Feta is just the thing. Today's Zucchini Crudo is a great option if you are looking for an elegant yet exciting veggie side. It's packed with flavor thanks to Lemon Juice and Zest, super spicy Thai Chilies, and fresh Mint. A sprinkling of French Feta chunks (French Feta is milder than Greek Feta) add some nice, round saltiness and cool the spiciness of those Thai Chilies. Be sure to allow this dish to marinate about a half hour to an hour before serving. It looks pretty stunning on the plate and tastes amazing if you like big bold flavors on your Vegetables. 1 or 2 Small Thai Chilies (depending on your spice tolerance), minced. 1. Lay the Zucchini Ribbons In a leak-proof container with a top. 2. In a small bowl, combine Oil, Chilies, Lemon Zest, Lemon Juice, and minced Mint Leaves. Stir in the Salt and Pepper. Pour the dressing over the Zucchini Ribbons and seal the lid. Shake well in several directions until all Ribbons are coated. Allow to sit a half hour to an hour. 3. When ready to serve, arrange about 5 slices of Zucchini in small bundles across each plate. Drizzle with any leftover dressing from the container. Scatter with French Feta and garnish with extra Mint Sprigs. Enjoy! Our yummy and vegetarian friendly BLT adapted from a clever recipe in the latest Food & Wine is super satisfying. We changed up the Richard Landau's ingenious original recipe just a bit by using more accessible Portobello Mushroom Caps instead of King Oyster Mushrooms. Also, I got the idea to spike my faux "Bacon Mushrooms" with a healthy pinch of Spanish Hot Smoked Paprika to achieve something a bit more like smokey Bacon flavor. In a final tweak, I created a Dill Mayo (I love the brightness of Dill) rather than the (I'm sure delicious) Basil Mayo that Landau employs. Tip- Real Bacon is salty so don't skimp on the Salt in this recipe. It makes the flavors come alive. 1. Combine Mayonnaise and finely chopped Dill in a small bowl and set aside. 2. In a very large skillet or grill pan, heat 2 Tablespoons Olive Oil over medium heat until shimmering. Swirl to coat. Lay the Portobello Mushrooms into the pan in a single layer in the pan. Keep in mind they will shrink considerably. Allow Mushrooms to cook about 5 minutes until very golden. Flip the Mushrooms to the other side and cook another 4 minutes. Remove to paper towel to drain off oil. 3. Immediately sprinkle the mushrooms with Salt and Pepper to taste, and finish by sprinkling all over with the Hot Smoked Spanish Paprika. 4. To assemble Sandwiches, spread 2 slices of toasted Bread with the Mayonnaise/Dill Mixture. Top each with as many Tomato slices as you like (we went with two thick slices per sandwich). Sprinkle the Tomatoes with a good pinch of Salt. Add the even amounts of the Mushroom Slices and then top with two slices of Lettuce per sandwich. Top the Sandwich with the other bread halves. Garnish with Dill Sprigs, serve and enjoy! See? Two delicious dishes - no meat needed! My husband, the original "Bacon Boy" as we call him, ate this sandwich with no complaints. I know he'd prefer Bacon but I told him that he too must suffer for my art. We hope you enjoy these meat-free dishes that go from everyday to elegant in a snap. Don't forget to eat your veggies! Oysters and Wine. This past rainy Saturday gave rise to an impromptu trip to a few vineyards on Long Island's North Fork. Now I know that there's only so long we'll be able to get away with such spontaneous frivolity, but let me tell you, I am savoring every minute. Plus, we deserved a break after spending most of the day doing chores. Treat yourself, I always say. and wonderful local food specialties. 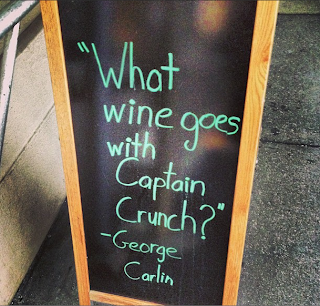 Now I'm no wine expert, but I have learned a bit more about the subject in recent years. (details on our Napa wine adventure HERE). The most important thing to remember is that wine tasting should not be intimidating. You don't need to have exhaustive tasting vocabulary or wine knowledge to enjoy wine. Also - Wine goes with everything! Take it from George. 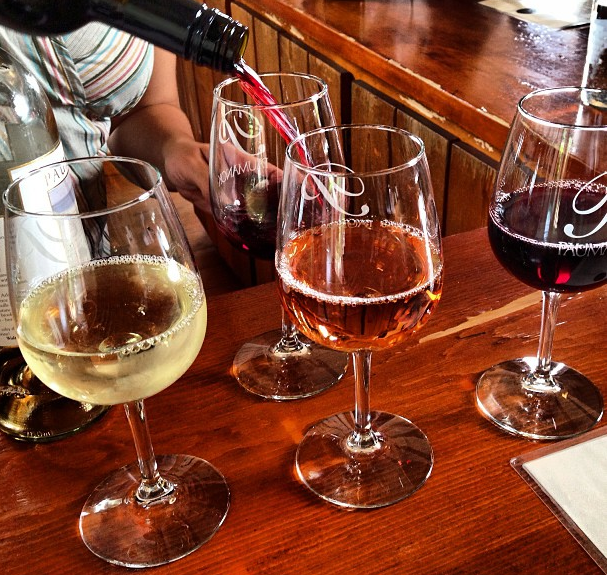 As far as tasting wine in the North Fork, 8 to 15 dollars will usually get you a comprehensive wine tasting. 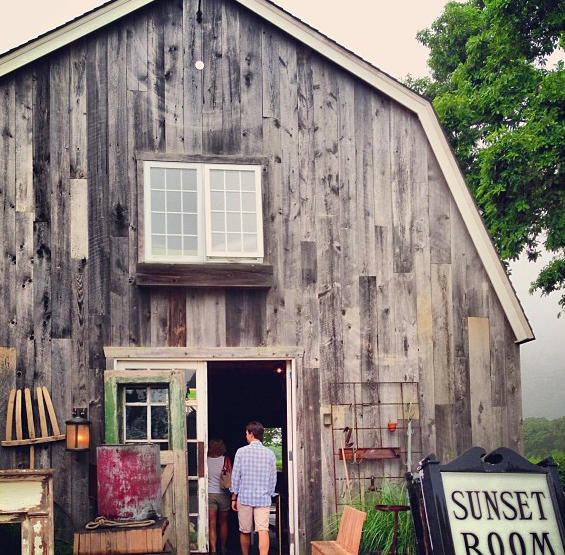 You can find many North Fork vineyards like the two we've spotlighted below that are casual and un-stuffy in style, but they do run the gamut. Better yet, a good winery will encourage you to take your time and linger. Some will even let you bring a picnic. Relax. 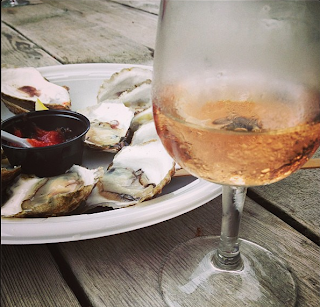 Bonus - Many of our favorite vineyards offer Oysters on Summer Weekends - sometimes even live music. Hey vineyards: You had me at wine, now you're just showing off. And I love it. Highlights - An adorably appointed, cozy tasting room bustles during the high season. The staff is friendly and fairly knowledgeable. Sherwood wines are, overall, good but there are a few that standout from the pack. 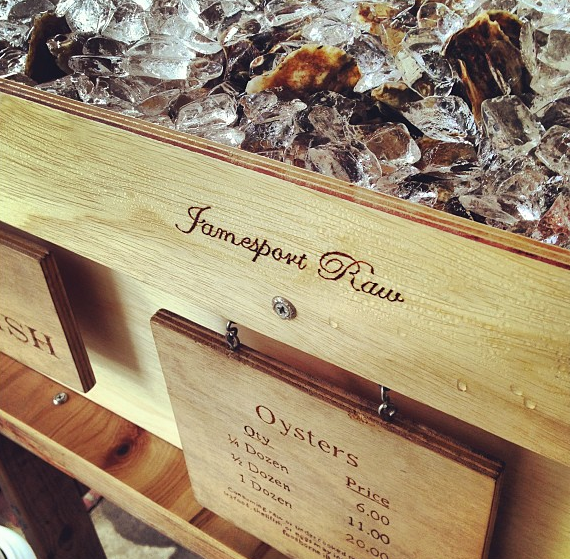 Extras - Sherwood's Jamesport Tasting Room serves Oysters on many Summer Weekends. They also offer great live music, and the converted 1860's farmhouse that houses the main facility has many rooms to meander though or relax in.The main area's fireplace that becomes a focal point in the colder months, and there are also several attractive outdoor spaces for balmy days. A super-rustic yet lovely event barn and a cool vintage home decor and art store attached. Like Pottery Barn on steroids. 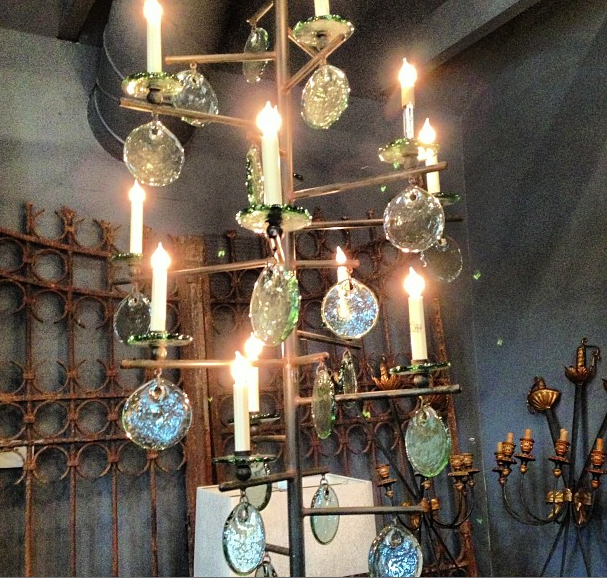 A beautiful chandelier in Sherwood's adjoining home goods shop was wonderful on the eyes. Highlights - Paumanok's large tasting room with lofted ceilings is very inviting, but is less personal and homey in feel than the interior at Sherwood House. It is the outdoor tables overlooking the vineyard that are the most lovely. Paumanok, and many of the local wineries for that matter, also offers Oysters on select weekends, but we'd had our fill by then - that is, until dinnertime rolled around. Later, we headed to Squiretown Restaurant and Bar on the South Fork where they awesomely offered Raphael Vineyard wines on tap! 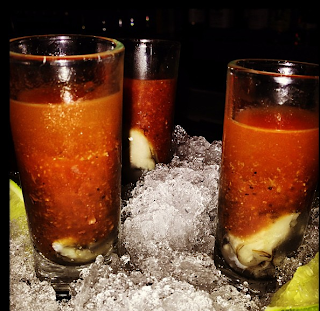 We very much enjoyed our dinner at Squiretown, and, to cap off our Oyster-filled day, kicked the meal off with these super spicy and tasty Bloody Mary Oyster Shooters. Hope you had a great weekend filled with the people and foods that you love as well. Last week's July Fourth holiday was just as it should be - a day of fun in the sun and an excuse to fire up the old all-American grill. Today, I'd like to share the fastest and easiest dish of our spread, super simple Shrimp Skewers that looked beautiful and tasted even better. Next time you're looking for an easy yet impressive appetizer or the surf to accompany your turf, Honey Sriracha Glazed Shrimp Skewers are a great choice. 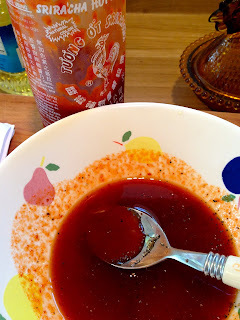 Make them if you are a Sriracha lover who can handle moderate heat and if you enjoy sweet and spicy flavor profiles like I do. 1. Soaking the wooden skewers for about a half hour is a good idea before using them on a grill in order to prevent any burning. 2. Martha Stewart, from whom this recipe was adapted, very wisely advises that you use two skewers for each row/serving of Shrimp. Pierce one skewer through just about at the tail, and another through the opposite head end. Doing this allows you to flip the skewers more easily and prevents the Shrimp from curling up. I used these shrimp skewers as an accompaniment to a hamburger, so for us, about four large Shrimp per person was just right. 3. If you can get your fishmonger to peel and devein the shrimp leaving the tail on, all the better. Cleaning Shrimp is one of my least favorite cooking chores, and frankly, it takes time! Buying pre-cleaned shrimp (preferably wild) or paying a bit extra to have the cleaning done for you is a huge part of making this dish as easy as it should be. 4. 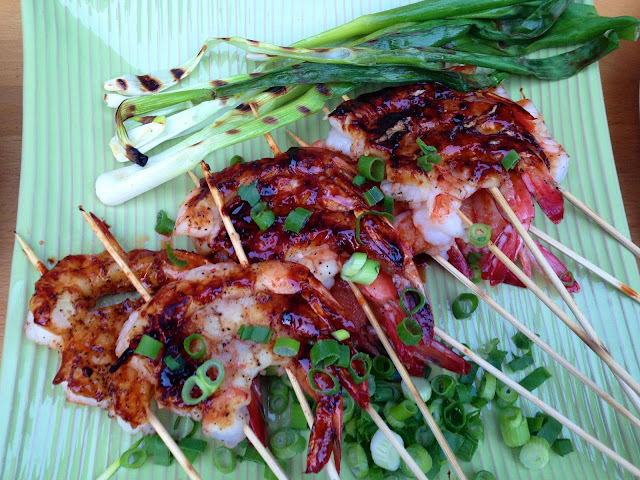 For a pretty green edible garnish, we opted to scatter the Shrimp with chopped Scallion and whole Grilled Scallions. To grill, we simply brushed the whole Scallions with oil and dusted them with Salt and Pepper. We let them cook for the duration of the Shrimp's cook time, turning once on the grill until they charred a bit. You could certainly garnish this creatively with other greens such as Cilantro or Parsley, but Scallions fit well with this Asian-inflected dish and I just love the look of them with char marks. 2. Lay peeled and deveined tail-on Shrimp on a work surface. Make a row of 4 Shrimp. Skewer the Shrimp through the tail end just before the tail, and through the opposite end (where the head would be). Repeat until you have 6 skewers of with 4 Shrimp Each. 3. Brush Shrimp all over with Vegetable oil and Sprinkle Shrimp all over with Garlic Powder, Salt and Pepper. 4. Prepare the Glaze by Mixing Sriracha with Honey and sprinkling with a healthy dose of Black Pepper. 5. If using, brush Whole Scallions with Oil and sprinkle lightly with Salt and Pepper. Chop the extra Scallions. 6. Place Skewers (and whole Scallions, if using) on the hot part of the grill. Grill the Shrimp until they start to become opaque - about 3 minutes. Flip and brush generously with the Sriracha and Honey Glaze. Cook another 3 minutes and serve immediately, scattered with chopped Scallions and Grilled Scallions.